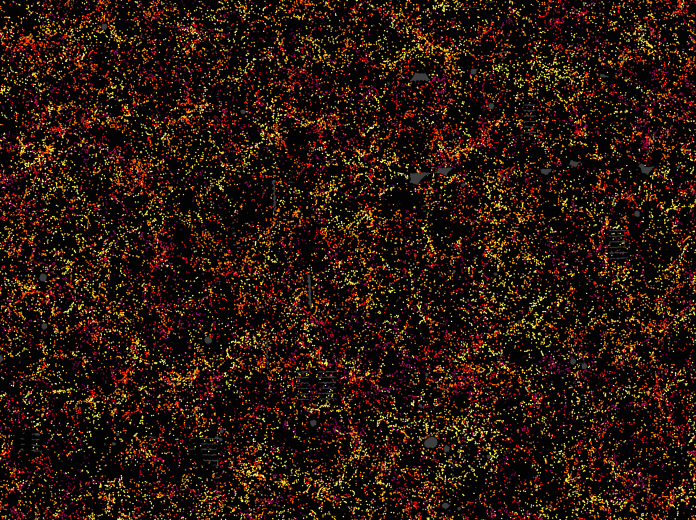 A team of Astronomers depicts a 3D image of record-breaking Map of 1.2 million galaxies on measuring the properties of Dark Energy. The large three-dimensional image is structured by Sloan Digital Sky Survey and BOSS (Baryon Oscillation Spectroscopic Survey). If you clearly observe each dot, the picture shows galaxy positioning about 6 billion years into the past. The colour in three-dimensional images shows the distance from earth. The galaxies are highly clustered, yellow meant the near side and purple indicates the far side and the grey dots are the regions that weren’t surveyed. BOSS whole the responsible to measure the expansion rate of Universe by determining the size of BAO in 3D distribution of galaxies and the BAO (Baryonic acoustic oscillations) original size is determined only by the pressure waves that travel through young Universe i.e. 400, 000 years old. The Universe is 13.8 billion years old currently. An astrophysicist, David Schlegel at Berkeley Laboratory (Lawrence Berkeley National Laboratory) and principal investigator of BOSS noted that “we have made the largest map for studying 95 percent of the universe that is dark. The map shows the galaxy pulled towards another galaxy by dark matter with some gravitational force. You can observe in the sky that SDSS and BOSS have transformed a 2D image of the sky into a 3D map spanning distances of billions of light-years. The map shows 10 percent of the survey area (which includes 120, 000 galaxies). The Berkeley Lab news centre mentioned that the physicists and astronomers have spent over five years, on collecting the measurements of 1.2 million galaxies (covered in one-quarter of the sky). It is to map out the structure of the universe over a volume of 650 cubic billion light years, says Jeremy Tinker of NY University and co-leader of the scientific team carrying out this effort. BOSS (Baryon Oscillation Spectroscopic Survey) and SDSS-III (Sloan Digital Sky Survey – III made these measurements i.e. of dark matter and dark energy. The map revealed by BOSS and the papers regarding these results were submitted to the Royal Astronomical Society.